The clocks going back a couple of weeks ago marked the end of our ORCA season onboard KING SEAWAYS, and what a season it was! With a record number of identified species in one season, Wildlife Officers and passengers onboard spotted a range of marine wildlife from our viewing deck, including white beaked dolphins, porpoises and Minke whales. The ORCA Wildlife Centre onboard, located on deck 9 aims to educate passengers on what lives in the sea they are crossing over on the Newcastle-Amsterdam route, to gain knowledge of the wildlife and how we can protect them. The ORCA Wildlife Officers collect vital research and monitor the understudied offshore marine environment as well as promoting wildlife watching and conservation through educational activities and presentations onboard. The Wildlife Officer programme is well established on KING SEAWAYS and has engaged with over 10,000 people on board this summer, who often spend over an hour with ORCA Wildlife Officers. The officers are more than happy to share their passion with you, one evening over the summer the ORCA centre stayed open until 11:15pm due to such high interest. 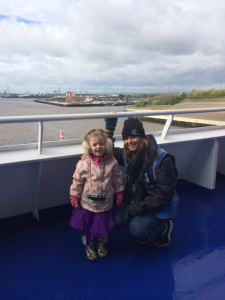 We caught up with Rachael, one of the wildlife officers onboard to find out her personal highlights from the 2015 season. ‘After such a successful season it is so lovely to know that the passengers’ experiences onboard are staying with them after their trip. I have received so much positive feedback, handmade cards and even recruited a few new ORCA members, and this is why I love my job. ORCA Your Seas project was recently one of seven finalists in the Environment category of the 2015 National Lottery Awards. Out of hundreds of entries ORCA came second, a fantastic achievement and a testament to all the hard work carried out by the organisation alongside DFDS. Thank you to everyone who voted!